Book Description: Want your kids to care about the environment? This is the fourth book in the Terry Treetop best sellers series. Terry loves climbing trees and hence the nickname. When he went camping with his parents and he saw some dolphins, including this little dolphin named Dido. Terry tried to make friends with the dolphin but the dolphin was stuck in a net. See what happens to Dido as Terry discovers a way to help his new friend. He climbed a tree looking for someone to help. Finally Dido was rescued and Terry was able to play with his new found friend. You don’t want to miss this book. Recommend to children from intermediate readers to Middle School readers. Length 48 pages. My review: I would recommended this book for children who love adventures, animals and swimming. Just the right length for this age group. It has Cute and creative illustrations. This is only one book of a set of Terry Treetop books. 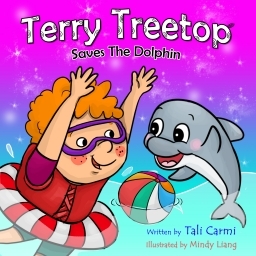 It is the fourth book in the Terry Treetop best sellers series. I was given this E-book free for an honest and unbiased review.